KATHMANDU, Jan 24: Nepal Entrepreneurship Summit 2019 will be held on February 14 in Kathmandu. Organizing a press meet, Confederation of Nepalese Industries (CNI), jointly with Bishal Media Group (BMG), announced that the event with the theme of “Federal Nepal: Opportunities for Investment and Growth” will aim to improve the entrepreneurship landscape in the country. The event is supported by Ministry of Finance and Ministry of Industry, Commerce, and Supplies. The event is looking to identify key entrepreneurial areas to create sustainable and substantial economic drive, develop networks between small, medium and large entrepreneurs to lead the charge for innovative environment in the economy, and address the existing laws that must be modified to meet and promote the rapidly evolving business landscape in the country. President Bidhya Devi Bhandari, Prime Minister Khadga Prasad Oli, and Finance Minister Yuba Raj Katiwada will be distinguished guests at the event. Secretary at the Ministry of Industry Yam Kumari Katiwada, entrepreneur Upendra Mahato, and CEO of Nabil Bank Anil Kesari Shah, will be among other prominent speakers at the event. 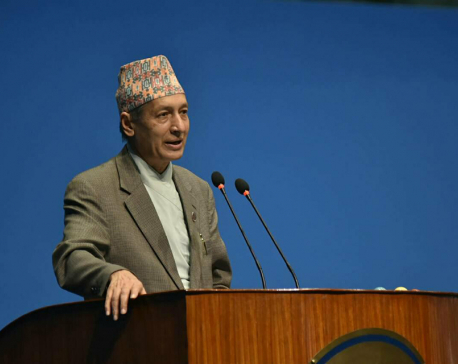 Hari Bhakta Sharma, president of CNI, said that the confederation was looking to push the establishment of ‘Industrial Excellence Center’ aimed to improve research environment, organize training programs for entrepreneurs, and reduce the dependency of remittance to develop the Nepali economy.